It’s a decent bet that every pilot and owner in Canada will know Aircraft Spruce. It’s almost impossible to fly here and not know a company which has been in the business of supplying pilots, mechanics and builders for over fifty years. At the outset, it’s worth explaining the name “Aircraft Spruce”. In 1965, following many years experience as both an aviation supplier and pilot, Bob Irwin along with his wife Flo started a business selling aircraft grade spruce lumber for construction and restoration. Aircraft Spruce Co. grew quickly to incorporate other items, necessitating a name change to Aircraft Spruce & Specialty Co., whose mission was and still is, to offer a diverse range of items to meet the needs and demands of every general aviation pilot. The “new spruce” of sorts – tubular steel and aluminium for airframe and other uses. From two people fifty years ago, the company now employs over 150 in the US and Canada, operating out of huge facilities in California and Georgia, as well as the familiar-to-us location in Brantford, Ontario. Aircraft Spruce (as we all know it) is the largest supplier of aircraft parts and pilot supplies in Canada and when combined with the US locations, one of the biggest in the world. We sat down with Dave Puskas, general manager of the Brantford location to find out a little more about this staple of the GA flying community. The Brantford op delivers hundreds of orders daily in Canada of all shapes and sizes. With over 100’000 available products, the range of items is vast. From a simple nut/bolt to an entire aircraft kit, the team need to quickly and accurately pick, consolidate, package and ship orders to every corner of Canada – the second largest country on the planet. That’s no mean feat! All items are stored either in the Canadian location or in the huge US warehouses, not “drop shipped” direct from suppliers. This means the company controls and manages the entire experience, quality and responsibility to the purchaser. This stocking strategy also ensures much better availability than relying on many different manufacturers’ lead-times. The Brantford facility, a 10,000 sq.ft building with warehouse, sales and counter has every inch accounted for as the images herein will attest. Make no mistake however, this is no random jumble of parts and boxes, it’s Swiss watch-type movement of organized bins, conveyers and areas where these specialists do their thing. There’s Dave the manager, 5 sales staff plus the warehouse staff for a total workforce of 15. Coming from a background in an almost identical set-up (different industry), it was great for me to see the coordinated activity and I recognized every part of the operation. From goods-inwards and storage to packing and fulfillment, all activity is geared towards geting the order correct and delivered ASAP. There was no mess. There was no fuss. These guys and gals know exactly what they are doing. 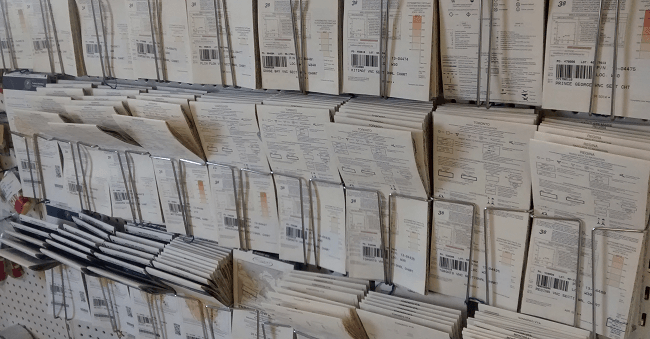 Obviously, 10,000 sq.ft of space can only store so much inventory, but when combined with another 114,000 sq.ft in the US with rapid inter-branch transfers, the result allows for a much larger on-hand product range. Add to this the advantage of product specialists to answer questions on suitability and usage and you’ve got yourself an winning strategy. These specialists, some having over 30 years experience in the industry, are available for every client and provide a valuable “human library” of knowledge in an industry where experience is a prized asset. Dave summed-up their mission: “it’s our job to keep Canadian pilots flying safe”. It’s a short statement but is exactly what we as pilots and owners need them to do. We want to be airborne and we need to be safe – that’s GA in a nutshell. The website brings much-needed efficiency to an industry which needs to display an enormous range of items. If you’ve been around GA for a while, you’ve seen the telephone-book sized catalogue of parts available from the company. The website brings not only easy searching and product research but opportunities for services like price matching, deal of the day, bargain bin and more. 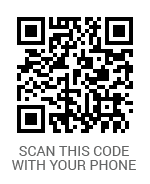 There’s now even Paypal payment available. A great value to having a dedicated Canadian resource is both pricing in $-CDN and no border or importing worries – the guys in Brantford do all that for us. If you’ve ever bought items from south of the border, you’ll know what a delight it is not to have to deal with that nonsense. Although it’s a US-based company, make no mistake, Aircraft Spruce is well invested in Canada and the Canadian GA market. Same day delivery is available for certain items and areas for rush jobs, because these guys understand what it means to be stuck on someone else’s ramp with a broken bird. They “get” the industry, the challenges for GA pilots and strive to deliver services which makes our lives easier. It’s honestly not worth talking about products sold and offered by the company as it would take-up the whole article and the rest of our website. 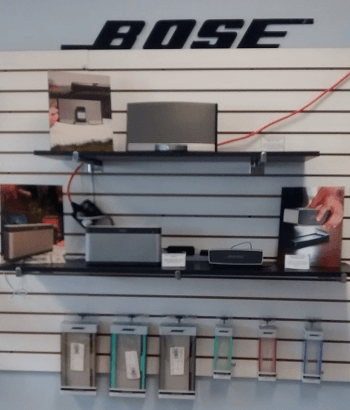 Suffice to say that new products and ranges are continuously added, like the new “Bose Authorized Dealer” products now offered, complimenting the previously available headset line. As mentioned, Dave was our contact and it’s worth spending a minute to introduce him a little. Dave has been with the company for 5 years and comes into management from the warehouse, meaning he’s been brought-up not in the “sales-pitch”, but in order fulfillment. This becomes obvious by the way he refers to his team and his understanding of the ground-up operations. I asked what Dave would say to those owners and pilots not currently clients and continued, “let us prove the difference to you with our service and prices”. Dave has absolute confidence in his team, company and ability to impress any client with a positive result but is not afraid to hear criticism or suggestions. “We really do welcome feedback” he said “knowledge is power and the more we know about what our clients don’t have or get, the better we can provide a proper solution”. We set-out to write an article on a pilot and GA supply facility but what we found was a more human story of a happy, dedicated group of professionals working in an industry they love and understand. We weren’t sure whether this was, as sometimes happens, a Canadian “also-ran” part of a large US operation, but it was clear that the commitment to Canada and it’s importance to the company is absolute at all levels. 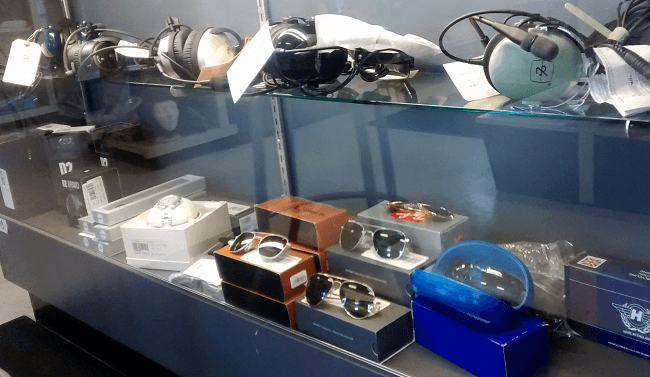 The fun stuff – headsets, sunglasses and gadgets galore. The operations of a warehousing and distribution facility are pretty standard so it’s the people who make the difference – and we found that difference here. We want to thank Dave and all the team at Aircraft Spruce for both spending their time with us and for keeping us safe and flying! Drop-by their website at: http://www.aircraftspruce.ca for much more.